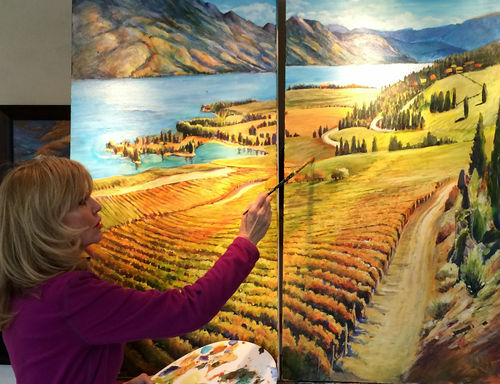 Her breathtaking renditions of vineyards both local and abroad capture the true essence of the trade. 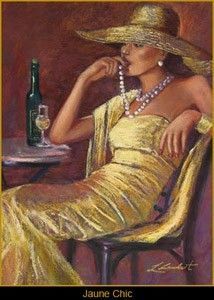 Both tourists and locals alike acquire her work as a way of taking home some of the ambience of their vineyard visit. These paintings have been acquired by visitors to studio from around the world. Her originals can be found in fine homes throughout Canada, the United States, Europe and Australia. 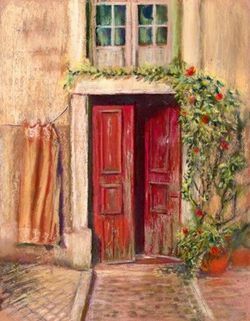 CAPTURING THE BRISTISH COLUMBIA WINERIES with a Tuscany and French Style, emitting warmth and ease, these painting create a beautiful focal point or accent your home. For those who want to try their hand at painting, you can experience working with the artist first hand. You may wish to reserve your spot in one of the "Painting Vineyard series", scheduled throughout the spring, summer and fall. VISIT THIS WORKING STUDIO, where art is in creation and its magic unfolds, beneath your eyes, just 1 minute away from Mission Hill Winery, and just above Quails Gate Winery with ample parking. Join us in our many events scheduled throughout the year. Choose from Plein Aire Painting, painting in a selected Vineyard, lead by Louise or our new event 'Capture your Spirit Animal in paint'. Take home a memory of your Okanagan Valley, British Columbia experience, from these popular art works. Learn how they were made and where their inspiration came from. Louise will usually be working on her latest commission as many people now want artwork just created for them, in their colour, size and theme preference. Why not see how this is done, by visiting the studio for an inside look.